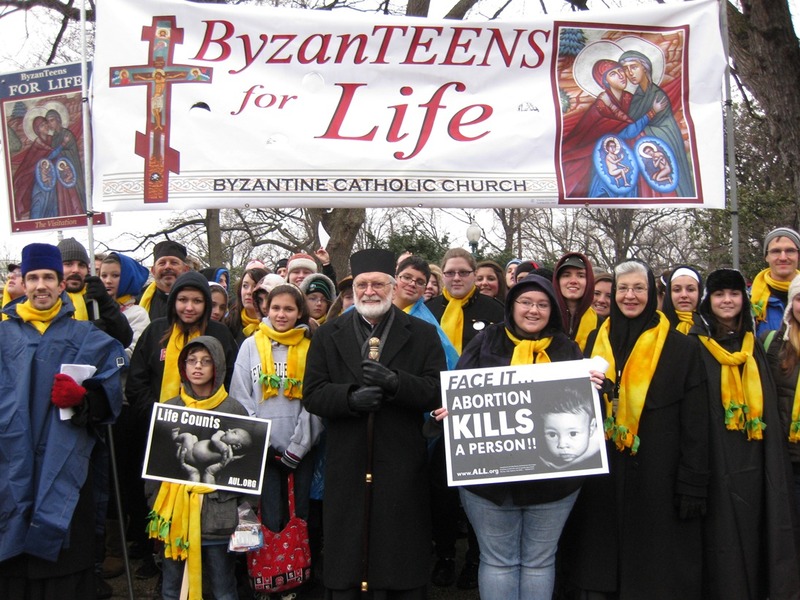 This year we again organized the Eparchy of Parma's ByzanTEEN trip to the March for Life, which took place on Monday. 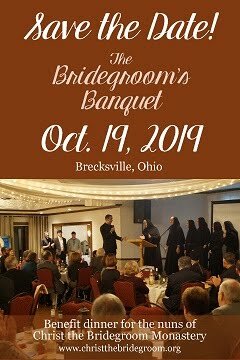 We were blessed to share the experience with a great group of teens from Ohio, Indiana, Michigan and Pennsylvania, along with a few seminarians studying at the Byzantine Catholic Seminary in Pittsburgh. We also met up and marched with teens from North Carolina and priests from various states. 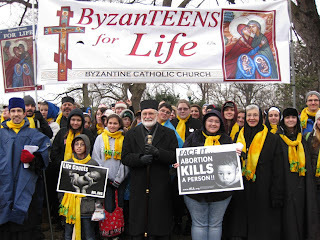 Among the hundreds of thousands of people marching to the Supreme Court that day, our group could be heard singing Marian hymns and marching behind a large "ByzanTEENS for Life" banner. 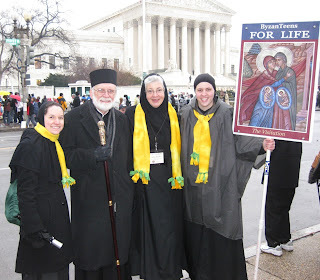 Bishop John joined us and gave us his blessing after we sang a few last Marian hymns at the Supreme Court Building. The theme that continued to reoccur throughout the trip was, "Every life has a purpose." On the way to DC we watched and discussed the movie Simon Birch on the bus, a movie about a teen boy who was very small due to birth defects, but who felt that God had created him that way for a reason and that he would one day be a hero. 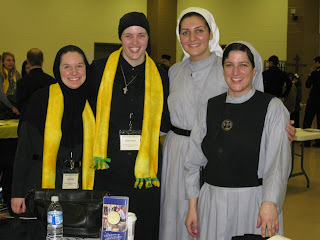 We also talked about vocations and visited the Eastern Catholic vocations fair at the Ukrainian Catholic Shrine. The teens came up with questions together in their groups to ask the priests, deacons, monks and nuns that they would meet there. This gave them an opportunity to learn about some of the vocations in the Church and to think about what purpose God might have in mind for their lives. Following the vocations fair, we visited the Blessed John Paul II Shrine right next door for the Sisters of Life "You and Me" exhibit. This multi-media exhibit followed the lives of six different people who had to make difficult decisions and found freedom and joy in making the self-sacrificing decision (such as choosing life for his or her baby). It was a very powerful exhibit that caused us to think about our decisions and the reasons why things happen the way they do. It also taught us how much God loves us, not for what we can do but for who we are. We reminded the teens that we were going to the March for Life to tell the world that life is beautiful and that God has given every human being a purpose. We also asked them to think and pray during the trip about what particular purpose that God has given them. 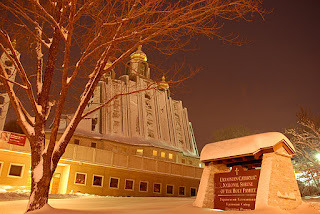 We are grateful to Epiphany Byzantine Catholic parish in Annandale, Virginia, for hosting us for a delicious dinner on Sunday night, and to Holy Transfiguration Melkite parish in McLean, Virginia, for hosting us overnight. Compline prayed that night in their beautiful chapel was absolutely heavenly! (Those teens can really sing!) We were fortunate enough to receive tickets to the Youth Rally and Mass for Life at the DC Armory on Monday morning, and enjoyed praying with 10,000 other young people and cheering for Bishop John as he was announced among the concelebrating bishops. Our cheer was heard on EWTN, along with our singing of Marian hymns as we marched by the EWTN camera. We thank all who helped to make this trip possible! 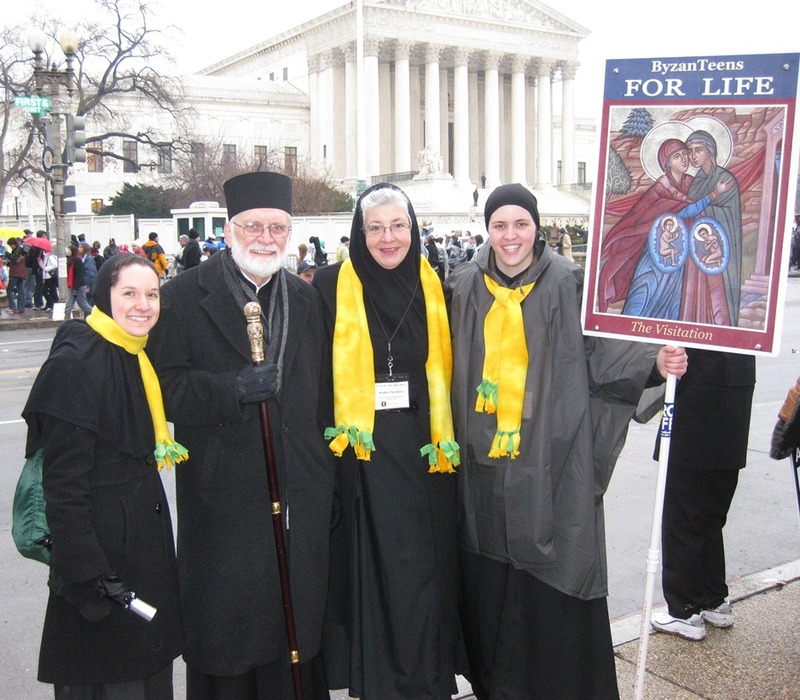 Calling all Eastern Catholics in Washington DC or who are headed to Washington DC for the 2012 March for Life! 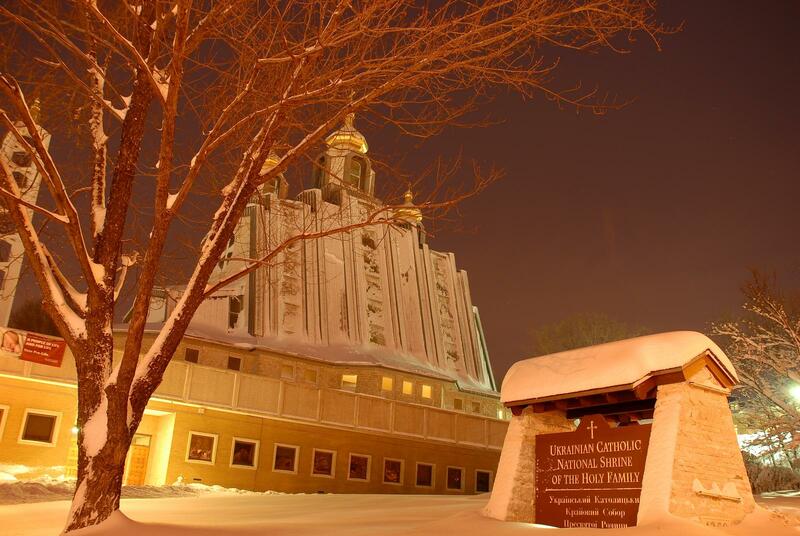 Please join us at the Eastern Catholic Vocations Fair, hosted at the Ukrainian Catholic National Shrine of the Holy Family on Sunday, January 22, 2012 from 1-4pm. We will have information available about our community at the Vocations Fair, and we will be attending with our group of March for Life pilgrims from the Eparchy of Parma later in the afternoon. We hope to see you there! We want to say a big THANK YOU to all the teens and young adults who attended our Girl's Sleepover at the monastery this weekend - as well as their parents for bringing them! We had a great time praying, eating and having fun with everyone! We started off the sleepover by celebrating Great Vespers for the Sunday after Theophany, which was followed by a traditional sleepover feast of pizza! All 18 of us around the dining room table! Then we decorated Christmas cookies, and settled into the living room to watch a few movies. We watched a great documentary on Blessed Chiara Luce Badano, an 18 year old Italian woman who died from bone cancer in 1990 and was beatified in 2010, and had a brief discussion about her life. 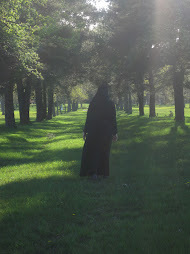 We played some games, watched another movie, and prayed Compline together. On Sunday, we began our morning with Matins followed by Divine Liturgy with the traditional Theophany house blessing celebrated by Fr. Stephen Titko. Afterwards, we had brunch with the girls and some of their families. We are grateful for the opportunity to open our home and spend quality time with such a wonderful group of young women. We thank God for the gift they are to us! Thank you young people, you rejuvenate the Pope, inspire the Church and refresh a world thirsty for hope and courage. New Year's Resolution...daily Byzantine prayer? Wishing you had an easy way to incorporate the daily prayer of the Byzantine Church into your daily schedule? While Roman Catholics have a handy compact breviary, we often laugh that the "Byzantine breviary" consists of a whole stack of heavy books! (You should see us packing them up when we have to pray on the road.) This makes it difficult for lay people and clergy to pray the daily prayers of the Church. Well, we are excited to share some news with you that we found in our inbox this morning. 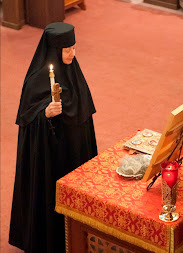 This format of prayer is a modified and abbreviated form of what we monastics pray, but we think it is a great way for lay people to participate in the life of daily Eastern Christian prayer, especially if you have a portable electronic device that can open emails. If you are interested, email the contact below today! Based on the positive feedback we have received to our initial market research, Eastern Christian Publications is going to offer a FREE trial of an electronic Byzantine Daily Office! 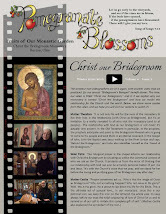 It will be distributed by email each evening for the following day and contain the texts for morning and evening prayer, and the First, Third, Sixth and Ninth Hours, along with the changeable parts as per the Byzantine Ruthenian Typicon (which we publish too) and the Gregorian date for Pascha. When the calendar dictates, we will also offer a version for the Julian date for Pascha. You can use it on your desktop, laptop, or any other portable device where you get email. It will be complete and contain all the prayers you need to pray on the bus, subway, at lunch, at a soccer game, dance class, or anywhere/anytime! If we find enough interest in the FREE trial, we will continue and ask for a modest subscription fee through our website -- only 25 cents/day or $7.50/month. We ask you to USE the file, and give us your feedback of how it could be improved, or if you like it, will subscribe to it, and recommend it to friends. Perhaps using some or all of this electronic Daily Office could be a New Year's Resolution for 2012. We have started with January 2nd, and will continue until further notice based on how many sign up and the feedback we get. Thanks for participating! Come and join our electronic prayer group for 2012!